Not long ago, we put together a post that was intended to assist our readers with that ever pressing issue of finding that inspirational recharge that is necessary for anyone in any creative field. In the design field, we tend to take our inspiration pretty seriously, and as a result we search both high and low to find any sparks we can root out. This can make finding some pieces that have not already been soaked up by the masses a bit difficult when trying to gather enough inspirational kindling to start a bonfire’s worth creative energy flowing freely. Which is precisely what we are hoping to do. And we believe that we may have succeeded with this new showcase that we have amassed for you today. Pouring through the web’s latest and greatest artistic offerings, we have gathered some freshly picked creative fruits to help fuel your design pursuits. Take a browse through some of these breathtaking artists portfolio pieces, dissect and digest them, and we are sure that your wellsprings of inspiration will once more be overflowing. 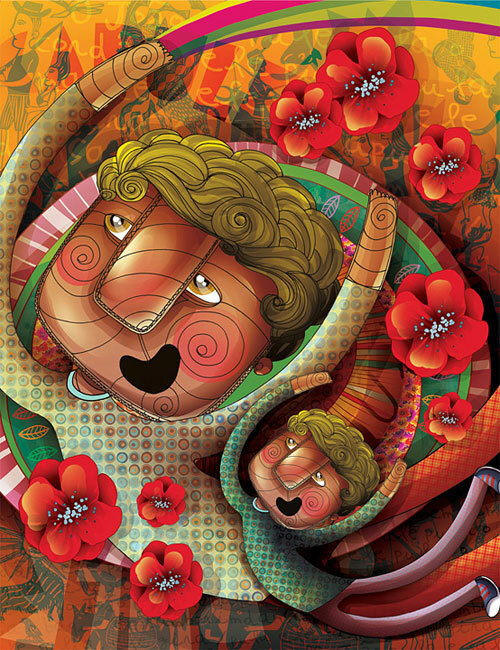 Anna Anjos’ portfolio is packed to the brim of unique and playful characters that are so full of color and vibrant imagery that they are sure to kick start this inspirational journey. Her voice stands out across mediums, easily identifying her singularly whimsical work. Dave Allsop’s gallery of work takes us deep into a darker corner of the fantasy art world. Having work that spans across numerous staples of the fantasy gaming genre, Dave was an easy artist to share in this showcase. Pat Perry’s gallery of work was a must have for this showcase, and with a quick glance through just the handful we have gathered for you here, you will know why. Pat’s richly detailed artwork exists between the surreal and the fully abstract, bringing the work to life from an obviously imaginative mind. Switching gears in the showcase, we turn to Anthony Geoffroy’s portfolio over at Behance for a little dose of whimsy. Anthony’s caricatures are some of the most stunning examples of the artform that we have seen of late so we had to drop under the proverbial spotlight. Taking the whimsy in a much darker direction, we land in the slightly twisted portfolio of imaginative illustrator Michal Dziekan. Michal’s work, which dances between the tongue in cheek and the macabre delivers commentary in a very artistic and biting manner. Lingering in the those richly artistic in between places, we come to the gallery of work belonging to artist Scott Altmann. Scott’s work dances between the dark and the lightly surreal in his personal works, but is more direct and playful in his commissioned work. His work does run an interesting spectrum. That brings us to the fantastic acrylic work that fills Thomas Ehretsmann’s gallery. Combining his pulp style illustrations, with his rich acrylics, Thomas’ paintings feel like a page ripped from the old hard boiled detective novels. Refocusing our spotlight, we now find the portfolio of another very talented illustrator sharing in the limelight, Iain MacArthur. Iain’s extremely intricate drawings use a lot of random geometric shapes to create and give form to his gallery of work. Jumping into another mixed media portfolio we move the showcase on to highlight the original artwork of french painter NIARK1. Using a combination of acrylics, pens, spraycans, and twisted imagery on wood panels, NIARK1’s style earned a richly deserved slot in the showcase. Jonathan Bartlett’s portfolio combines a light surrealism with a subtle, soft style that is somewhat reminiscent of Norman Rockwell’s work. Feeling as if the work was steeped in Americana, Jonathan’s art is sure to help get the inspired wheels a turning once more. The gallery of work that we found of Mathis Rekowski, was breathtakingly chaotic and came with a charge of inspiration that we were sure would resonate with many of our readers. Dark in tone, but so colorful and playful at the same time, Mathis’ work is so creatively twisted that it is sure to satisfy. Mike Friedrich’s portfolio contains some very inspiring illustration works that range from the more playful and concrete in nature, to the somewhat darker edges of the abstract. The work alone was what got him featured on the showcase, but the interesting range didn’t hurt either. FENIKS GRAFIX’ body of work is one that is most would consider to be relatively whimsical, yet it still maintains a bit of an edge. This is not the easiest of balances to strike, but through IKS’ gallery we find how adeptly it can in fact be done. Anton Semenov’s gallery overflows with darkly unique photomanipulations and other digital works that pass back and forth between frightening and haunting in their imagery. Almost as if Anton’s work delves into the world of nightmares and brings back some of its most mesmerizing and terrorizing captures with it. Coming back from the darkness, we have a much lighter and colorful portfolio to peak at with the often abstract artwork of Attila Brushvox. His work explores some very deep concepts even with their often playful, if not also a bit guarded, nature. In the last installment, we included a section that was dedicated to the numerous art communities that exist online, as wonderful outlets and resources for artists and enthusiasts alike. This time around, we thought that we would drop a couple of more into the showcase that were not featured the last time. So take a look at these new online communities for artists to see if perhaps they have what you are looking for. Be it a place to share your own work and connect with others, or be it a place to source out inspiring works or art! Socurio is an online location for artists looking to sell their work, and for those also looking to purchase it. This communal hub is one of the places that our readers turned us onto after the first post came out. Shadowness is an awesome collective for artists and designers wishing to connect and share their works. The site has an array of interesting features to take the experience to the proverbial next level. This was another user recommendation from the last post. Dropr is a new online artist community that we only recently discovered ourselves. This community is still in development, so there are many more exciting things to come, but it already seems promising in its early stages. So we expect to see some pretty interesting things develop. Now one of the main hindrances that many of us find, once we get that initial spark of inspiration is not having an available outlet to let the creativity flow. Which is where this section can come into play. Given that most of us spend a lot of time on the web, we have collected a handful of fun and handy online apps for image creation and editing for a quick and easy lightweight solution to this problem. Sketchpad is a relatively bare bones online paint/drawing application, or at least it feels that way from the simple, intuitive user interface. In all actuality, this app is fairly packed with options and functionality to appeal to and satisfy all levels of user. Aviary is an online service that you are probably already familiar with, but we had to mention in this section of the roundup. Otherwise this portion of the post would have felt somewhat lacking. Aviary’s free suite of powerful online creation tools have proven popular to users from across the globe, if you haven’t already, you should check them out. Muro from Deviant Art is an online drawing/painting app that works with your Wacom tablet and allows you to upload your new creations directly into your DeviantArt account with the click of a button. There is also an export function for those who do not have an account, so no need to let that keep you from this waiting online canvas. If you are looking for the depth of Photoshop in an online image editing app, then the closest that you are probably going to come is pixlr. pixlr is an incredibly loaded online image editor packed with functionality that is gaining in popularity among the online design community. Odosketch is an extremely simple and straightforward online sketch pad with a communal aspect driving the sharing function. From the whimsical to the classic, Odosketch provides a wonderful way to explore any inspired sparks kicking off in your mind. Color Scheme Designer is our final tool, and another must feature app that this list would not have been complete without. With ranges of control options for the user, a complimentary, customized color scheme is waiting for your design with just a few clicks of the mouse. Art Inspiration For The Weekend was the post that got this whole ball rolling here on Smashing. Finding Inspiration in Uncommon Sources: 12 Places to Look is another awesome post from the Smashing vaults that can assist you in your inspirational searches. I’ve only recently found your blog but I love how much effort you put into each post. I could spend hours working my way through this one but sadly don’t have the time. So much great stuff though, I love Pat Perry’s work. Stunning pics. i really loved this “Lost” cartoon pictures. Nice to see what some people can do with vector based programs…. First, thank you so much for the list of online art tools. I can’t wait to try them out. I was also amused by some recurring themes: zombies, skulls, variations of the word ‘whimsy’. Secondly, why is there only one example of a woman artist? Perhaps this deficiency is related to the aforementioned motifs?